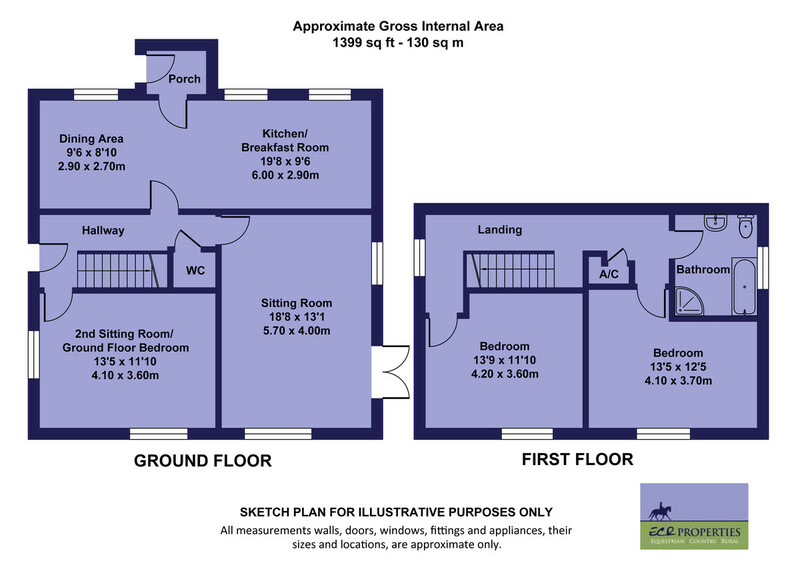 Entrance hall, sitting room, kitchen/breakfast room with dining area, cloak room and ground floor bedroom/second sitting room, two first floor double bedrooms, family bathroom. Front, rear and side gardens, large American-style barn with 4 loddon style internal loose boxes and lean-to hay store, barn with two internal stables and living area, fenced 25m x 40m sand manège range of timber open fronted barns , in approximately 8 ACRES (stms), further storage outbuildings, summer house, patio with raised ornate pond, separate entrance to equestrian facilities with gravel parking area, paddocks ring fenced with post and rail stock fencing. The property is on a byway, set off the A143, which provides immediate off-road riding, leading north to further byways, bridleways and farm tracks, providing extensive off road hacking. Diss 9.8 miles; Bury St Edmunds 13.5 miles; Thetford 10.5 miles; Newmarket 26 miles. The local villages of Hepworth, Stanton and Walsham le Willows are well served by schools, shops and pubs. The property is well positioned near the A143 providing quick access to Diss and Bury St Edmunds both of which provide a good variety of shops, supermarkets, schools and leisure facilities with rail links to Norwich and London. From Diss there is a direct link to London Liverpool Street. Vine Farm has been recently updated by the current owners and is well presented throughout. The accommodation in the cottage currently has two first floor bedrooms to the front of the property which have far reaching views across meadow land. There are two ground floor reception rooms currently a large sitting room with French doors to the outside and a further sitting room which could be used as bedroom three. The kitchen which has recently been updated and offers plenty of space is open plan to a separate dining area. There is room for a large American style fridge freezer, a built in oven and hob with extractor over, inset stainless steel sink and drainer and space/plumbing for washing machine. The range of wall and floor cupboards are shaker style with a wooden work surface. Vine Farm is a short distance up Dunhill Lane which is a byway off the A143. There is an access gateway to the house with a parking area and to the left of this there are some small storage buildings and sheds. and another driveway which leads directly to the yard and rear of the property. There is a further access gateway which is hidden and not currently in use, to the far boundary of the land to the A143. The gardens are laid to lawn with shrubs and borders, and mature trees including walnut and productive fruit trees. To the rear of the cottage is a split level patio area with a raised pond feature, an archway path of rose bushes, and a summer house. There are two barns with internal stabling. The main stable barn is well laid out with an ample tie up/storage area to the front and three internal Loddon-style loose boxes, 9'4" x 15'6"; 9'4" x 15'; 9'4" x 13'1". The second barn has two block built internal boxes. To the front it is set out as a day area with cupboards and work surface over. There is a large lean-to for hay storage. A further range of timber outbuildings in the meadow to the far boundary to the A143, useful for storage but could be updated to provide further stabling etc. The recently installed sand manège is approximately 25m x 40m and post and rail fenced. There are 6 paddocks which are separated by pole and electric, all within a post and rail stock ring fence. In total around 8 ACRES (stms). Dunhill Lane offers access to excellent off-road hacking.